One way to beat the heat is with some frozen yogurt. 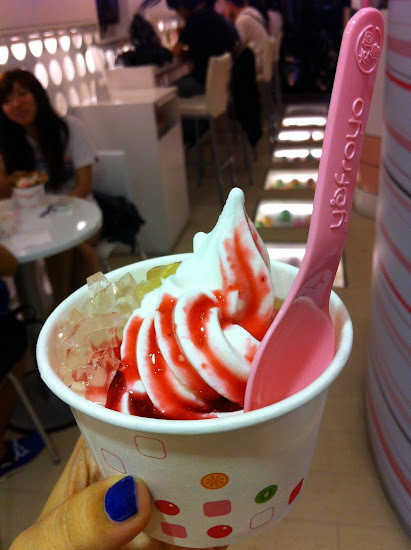 Yofroyo seems to still be going strong and added specialty flavors, acai berry and lychee tart to the line up. Spotted some new locations, including at Q Square & Ximending, and heard the tiny one in Gongguan closed awhile back. This is combo #1 with original tart, though I tend to favor the green tea/red bean combo too. gabrielle: thanks for commenting! i love yofroyo too.. do they have similar froyo in canada where you live? this is my friend's shop. i just visited last night and talked to him. the shida (not gongguan) location is still open. it's the original store. Lived in Shi-da area 3 years ago, and before I moved from there, it was closed. RIP one of the best cold treats in taipei.